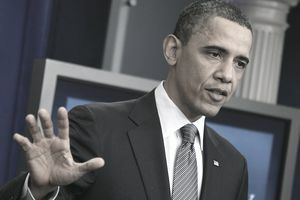 President Obama submitted the fiscal year 2011 budget to Congress in February 2010. If it had followed the normal budget process, the House and Senate would have debated the budget all year, and routinely passed it by the September 30 deadline to keep the government running smoothly. But 2010 was a bitterly contested mid-term election. Tea party Republicans adopted the federal budget deficit and debt as their cause, since the debt level was nearing 100 percent of gross domestic product. Democrats and moderate Republicans who faced strong competition from them were afraid they would lose their seats if they approved the budget. To address Republican budget concerns, the President appointed the Simpson-Bowles Commission in February 2010. Its goal was to lower the annual budget deficit to 3 percent of GDP, balance the budget by 2015, and reduce the long-term Social Security and Medicare deficit. The Commission released its report in December. It recommended measures to cut $4 trillion from the deficit by 2020, reduce the deficit to 2.3 percent of GDP by 2015, and reduce the debt-to-GDP ratio to 60 percent by 2023. But it recommended tax increases that Republicans couldn't support and spending cuts that Democrats couldn't support. Therefore, the Commission's recommendations fizzled. Meanwhile, instead of passing the budget by its October 1 deadline, Congress passed a Continuing Resolution to fund the government at current levels until April 2011. Despite 3 percent economic growth, and a reduction in unemployment from its height of 10.2 percent, voters expressed their dissatisfaction with the economy by electing a Republican majority in the House of Representatives. Republicans gained 60 House seats, with Tea Party candidates accounting for 28 of them. The budget debate raged on, and a series of stop-gap funding bills in March and April 2011 were approved to keep government services going. As part of the March budget debate, the Republican members of Congress proposed $61 billion in budget cuts. These cuts were from the Discretionary budget, and included reducing funds for child nutrition, programs to help pay for college tuition, and funding to improve food safety. Research from the Economic Policy Institute said the cuts would have cost 800,000 jobs. Finally, on April 14 2011, Congress approved a budget with $38 billion in cuts. There was $20 billion cut from discretionary programs, targeting health, labor and education. The remaining $17.8 billion was cut from Mandatory programs. However, a study by the Congressional Budget Office found that actual spending would only be reduced by $352 million. That's because of Defense Department increases, and the fact that many of the proposed cuts were in programs that probably wouldn't have used all their budgets, anyway. Spending was $3.603 trillion, lower than the budget of $3.8 trillion. Over half went towards mandatory programs, such as Social Security, Medicare and Military Retirement programs. These expenditures were mandated by law, and cannot be changed without an act from Congress. The government spent $2.073 trillion on mandatory programs, less than the $2.2 trillion that was budged. The most was spent on Social Security ($725 billion), followed by Medicare ($480 billion) and Medicaid ($275 billion). Proposals enacted under the Economic Stimulus Act actually added $38 billion to the budget, as banks repaid TARP funds. Military spending was $854.4 billion. Security spending is in layers. First is the Department of Defense base budget, which was $528.2 billion. DoD reduced waste by 17 percent by ending or curbing several programs, including the C-17 aircraft and Joint Strike Fighter Alternate Engine programs. Benefits for 9 million retired military personnel and veterans with disabilities were expanded. It allowed for improved care for wounded service members, especially those with mental health needs. Traumatic head injuries had become much more widespread, as improved field medical procedures allowed doctors to save many soldiers who had died from head wounds in previous wars. Added to that was $158.8 billion in contingency funds to support initiatives in Afghanistan, Pakistan, and a winding down of the War in Iraq. For more about the total costs of these initiatives, see War on Terror Facts. Other departments that support the military cost $167.4 billion. These included Homeland Security ($41.9 billion), the Department of Veterans Affairs ($56.4 billion), the State Department ($50.1 billion), FBI ($7.822 billion) and the National Nuclear Security Administration ($10.5 billion). The worst effect of the FY 2011 budget was its $1.3 trillion deficit. Deficit spending stimulated the economy, which was still needed in FY 2011. It was critical after a recession, when businesses were operating below capacity, and needed new customers. Deficit spending should focus on stimulating consumer spending and creating jobs. However, deficit spending has been ongoing since 2002. The deficits during and after the recession helped to create a (at that time) $15 trillion debt. As it continues, deficit spending puts downward pressure on the dollar's value. A lower dollar raises the cost of exports, and that can increase the likelihood of inflation. As the debt to GDP ratio approached 100 percent, investors became concerned that the U.S. might default. Or, they expected the U.S. to raise taxes in the future to get the revenue needed to pay down its debt. This anticipation of taxes in the future can drag down economic growth today. In addition, interest payments to finance the debt add to each year's deficit. In FY 2011, interest payments were $230 billion. For all budget deficits, see Deficit by President and Deficit by Year.